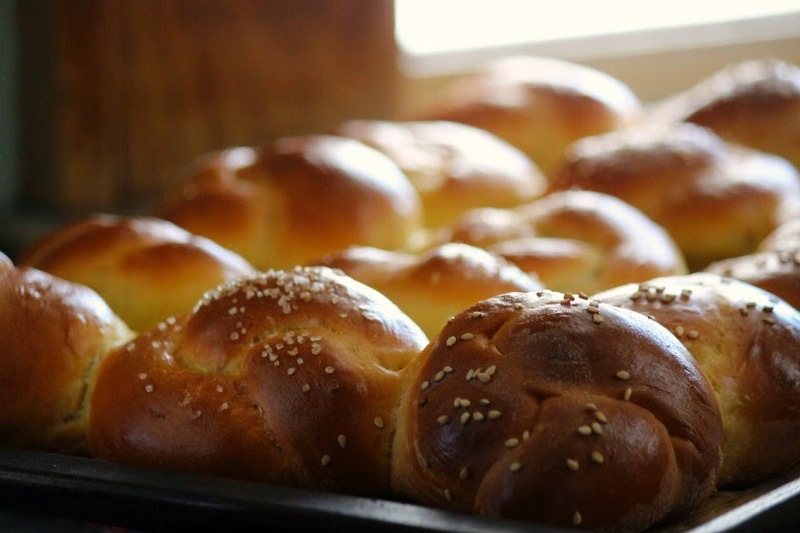 Who has never heard of Challah? It is a small part of long Jewish tradition. Rich with eggs and butter (or oil) it is usually shaped into braids and coils. Similar to French brioche and Polish Babka, it makes wonderful toast and this is the only bread I use for my Thanksgiving Caramelized Onion Challah Stuffing. These little beauties would great for Holiday bread, sliders, burgers and sandwiches. 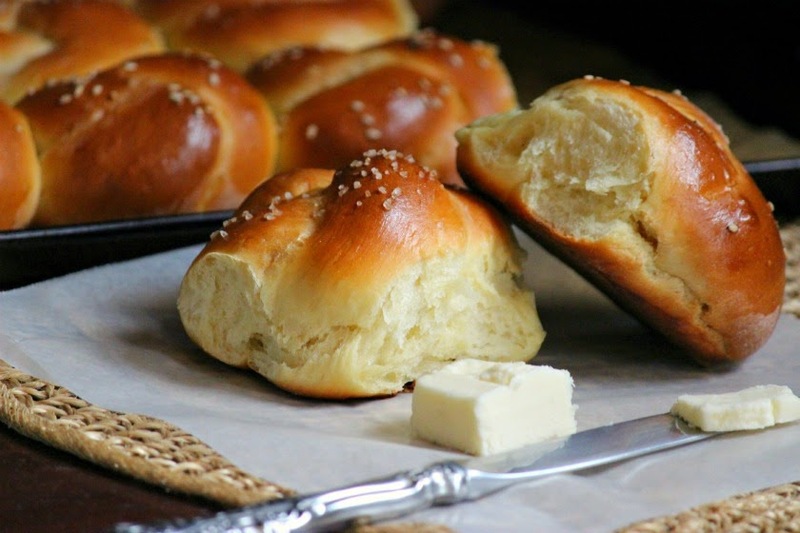 With the help of a stand mixer, these rolls are a cinch to make. In your Stand Mixer bowl, combine the warm water and yeast. Stir and allow to rest in a warm spot for about 10 minutes, or until foamy and frothy. Add flour, salt, sugar, butter and egg yolks and combine on low until dough comes together. Increase speed to medium and knead the dough, with the dough hook, until it forms into a soft and smooth dough, about 5-7 minutes. Add additional flour if needed, in small amounts, until dough is no longer sticky. Form the dough into a ball and place it into a large bowl that has been oiled. Turn to coat both sides. Cover loosely with plastic wrap and allow to rest in a warm spot for about 1 hour, or until doubled in size. Punch the dough down and allow to rest for another 45 minutes. Turn out the dough onto a lightly floured work surface. Knead a few times. Cut into 15 even pieces. Roll each piece into a rope about 7 inches long. Tie into a knot and tuck the ends underneath. 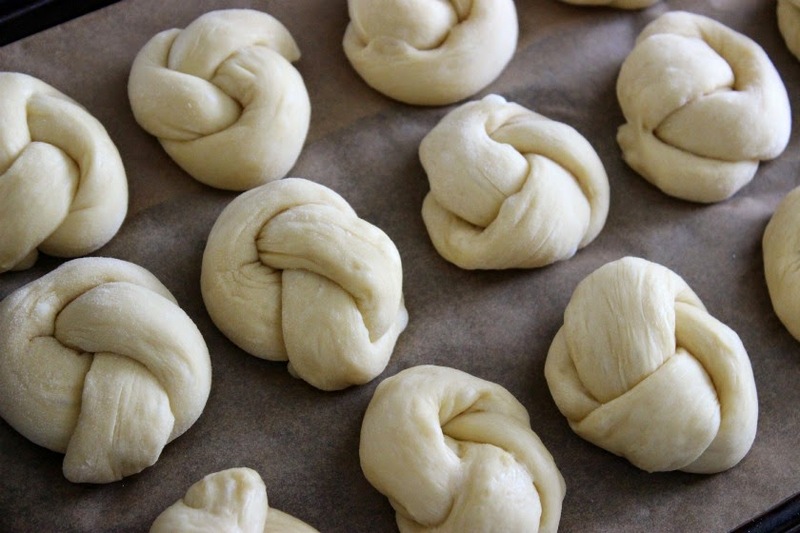 Place the knotted rolls onto a baking sheet lined with parchment paper. Cover with a clean towel and allow to rest while you heat up your oven. Heat oven to 350 degrees F. Brush the rolls with egg wash and sprinkle with toppings of your choice or no toppings at all! Bake for about 25-30 minutes or until golden brown. Cool for about 30 minutes. Store in sealed plastic bag as you would bread. Can be frozen after baked! Visit www.CountryCrock.com/recipes for recipes and meal inspiration. I'm so glad I found this recipe. It's so good! I always have leftover eggyolks after making a batch of swiss merengue buttercream and I always end up throwing the yolks away. This recipe is so easy and the end result is heavenly good. This is my go-to recipe from now on.